Home Rodin: The Human Experience Through Art Teacher Workshop on August 29! 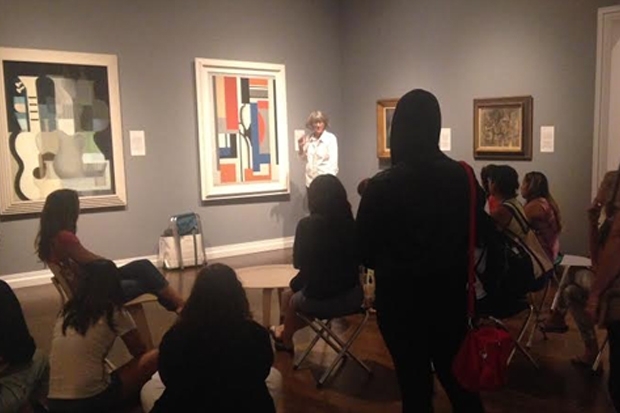 Rodin: The Human Experience Through Art Teacher Workshop on August 29! To help educators get the most of out of our upcoming exhibition Auguste Rodin: The Human Experience | Selections from the Iris & B. Gerald Cantor Collections (July 23-Jan. 10), the museum is holding a teacher workshop on Saturday, Aug. 29 at our Beretania Street campus. The exhibition examines the eminent French sculptor’s fascination with the human figure and his lifelong effort to breathe life into bronze. Known as one of the greatest sculptors since Michelangelo, Rodin broke with the classic traditions and created works in a modern style that depict natural movement and complex emotions of mythological figures and history’s heroes. This half-day workshop includes a walk through of the exhibition with Curator of European and American Art Theresa Papanikolas as well as a preview of the guided school tour that integrates visual arts with science and technology, literacy, and social studies. On the tour, students will explore the process of making bronze artwork, the anatomy and expressions of the human figure, and the story behind the characters or concepts Rodin sculpts. Students will receive a booklet to use in the gallery for writing and sketching and to take back to the classroom. We will also introduce a visual strategy that will enable you to talk about any work of art with your students. The session will conclude with a light lunch at the museum and an opportunity to discuss the exhibition and guided school tour with other teachers. Space is limited, so please sign up for this workshop today. Email gro.muesumululonohnull@elgnej for more information or to RSVP. I will be unable to attend the teacher workshop on August 29. Is there a way that I can get a copy of the student workbook? I will send you one.